Here is what Howard looks like after working at Big Blue. I took this picture of him lastnight when he got home. Speaking of pictures and buildings -- how is that for a segue? 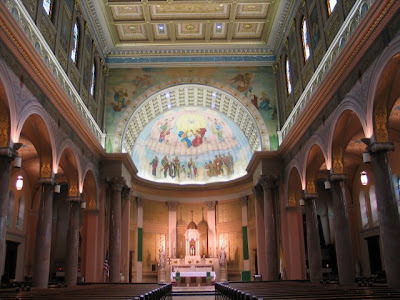 -- here is a picture of the interior of St. Gerard's, the Buffalo church that was closed thanks to the Diocese of Buffalo's Journey of Faithlessness and Disgrace, and is now, with luck, supposed to be moved to Atlanta. 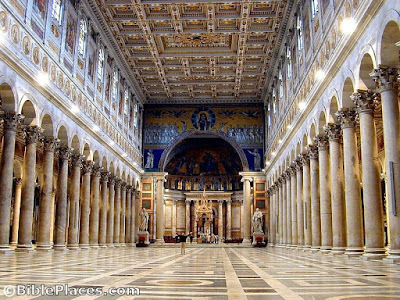 You know how they tell us Gerard's was a scaled-down copy of St. Paul's-Outside-the-Walls in Rome? They are not kidding. And here is St. Paul's-Outside-the-Walls. I was in it once but was too ignorant to take a picture. So I scrounged this one up on the Internet. The pope visited St. Paul's-Outside-The-Walls the other day which is what got me thinking about this whole thing. I saw a minute-long video of it and all I could think was: Gerard's! This video is on this priest's blog which I check out now and then even though he has yet to mention Leonard Pennario. If he mentioned Pennario I would check it out more often. We can certainly file Gerard's under Things Buffalo Had In Our Own Backyard But Were Too Ignorant to Appreciate. People here run their mouths forever about Louis Sullivan and Frank Lloyd Wright, which is fine, but then they leave Gerard's to crumble, the heck with it. They do not see the big picture, you know? I, in contrast, see the big picture. Here is another one of Howard.